Gentrification in KC: Is it Happening? And Where? Gentrification is an urban occurrence where neighborhoods undergo a significant shift in income levels by attracting wealthier residents. We are all familiar with dramatic turnarounds in the urban areas of many large East Coast cities like New York or Washington, D.C. Typically, wealthier residents move into lower-income neighborhoods because they are located in areas that are close to employment or cultural amenities. Over time, the entire socio-economic picture of these neighborhoods can change from low-income or even poverty to hip and trendy urban neighborhoods. Many would say that a city that is experiencing a good deal of gentrification is doing some things right. It has desirable amenities that are attracting people who have the income to choose where they want to live. However, gentrification is not without controversy. When neighborhoods become more and more desirable, and therefore more expensive, long-term residents can in effect be priced out of their homes, especially if they are renting. A recent study from the Federal Reserve Bank of Cleveland suggests that residents living in a gentrified neighborhood are actually better off (as measured by credit scores) than those living in non-gentrifying neighborhoods. For our analysis of gentrification in Kansas City, we looked at the median home value for owner-occupied housing units by census tract in 2000 and in 2011. Specifically, we took each tract’s median home value and divided it by the metro’s median home value to get a measure of relative home value. In 2000, the metro median home value was $104,700. In 2010, the median value was $159,600. A tract with a median home value below the metro’s median will have a value less than 100 percent. A tract with a median value greater than the metro median will have a value greater than 100 percent. One note: the 2000 data comes from the 2000 Census. The 2011 data comes from the Census Bureau’s American Community Survey 2011, which, for small areas like census tracts, is actually a survey conducted over a five-year period ending in 2011. 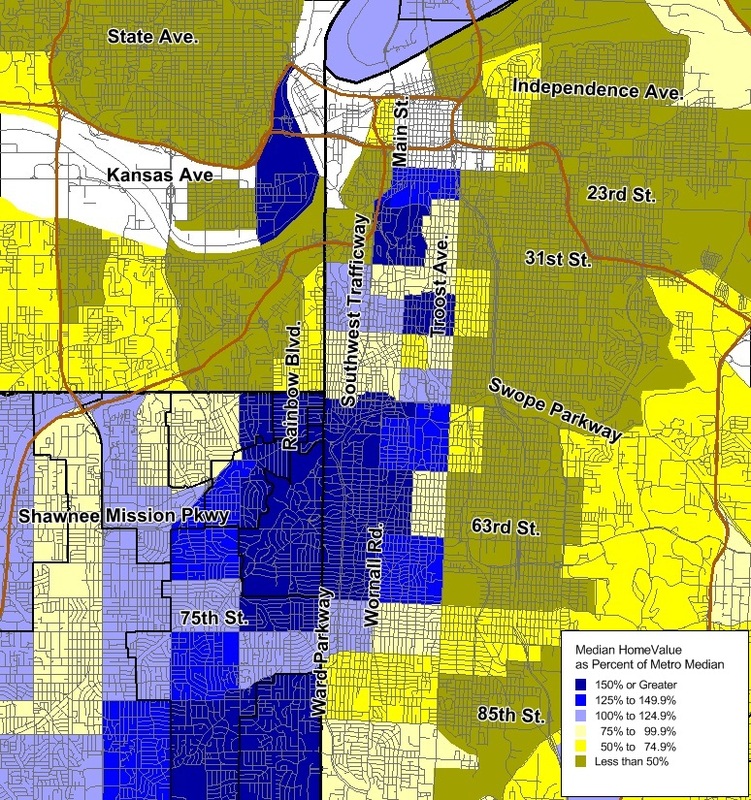 The first set of maps shows the heart of the Kansas City metro in 2000 and 2011. Areas shaded in blue have median home values above the metro median; the darker the blue the greater the value. 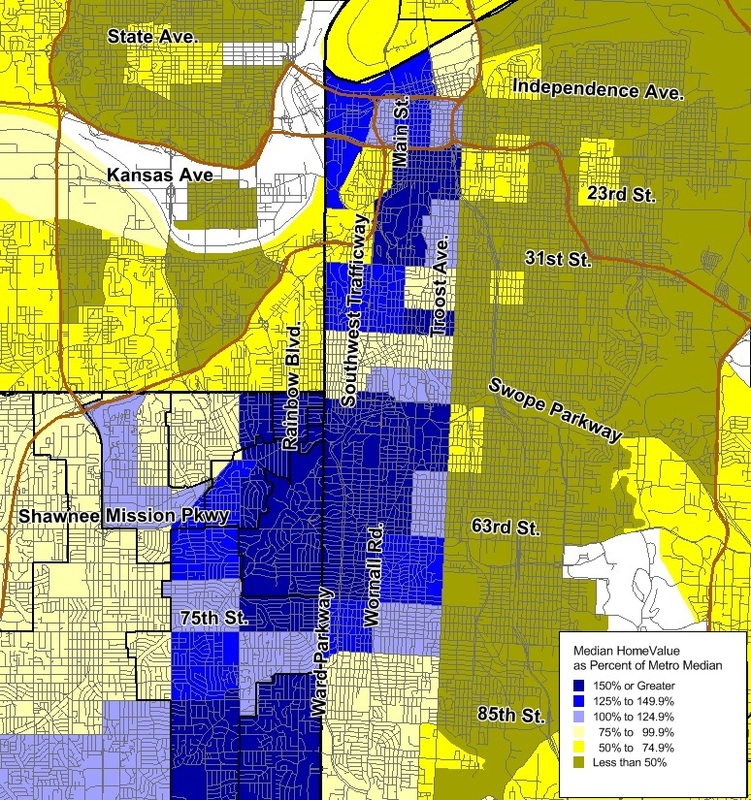 The tracts shaded in yellow have median home values below the metro median; the darker the shade of yellow, the lower the value. Tracts with no shading have no data because they have no (or very few) owner-occupied housing units. A quick glance at both maps shows that gentrification has not had a dramatic impact on the region as a whole. For the most part, tracts that had median home values below the metro median in 2000 still had lower home values in 2011. 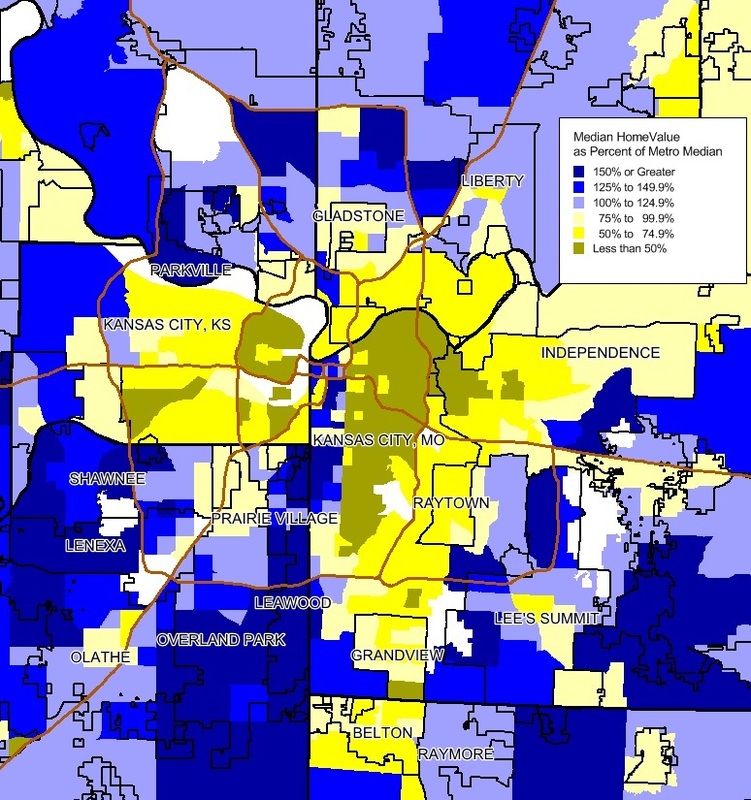 Overall, 41 percent of all tracts in 2000 had median home values above the metro median. In 2011, this figure increased to 42 percent. Also, the stark contrast between home values in most urban core areas versus the suburban areas is a constant in both the 2000 and 2011 map. Closer examination shows some interesting trends, however. Much of Wyandotte County shows increases in median home value between 2000 and 2011. In Western Wyandotte, there appears to be more — and darker — blue in 2011 than in 2000. In Eastern Wyandotte, the area of darker yellow appears to shrink and be replaced by lighter yellows. This indicates tracts that still have median home values below the metro median, but not as far below as they were in 2000. There also appear to be lower relative home values in many first suburb areas along the I-35 corridor in Johnson County and in the Northland. There is also a great deal of change in the Downtown to Plaza corridor, which shows up better in the two detailed maps below. The resurgence in downtown housing is evident in these maps. In 2000, Downtown had few owner-occupied units, and those tended to be well below the metro median. 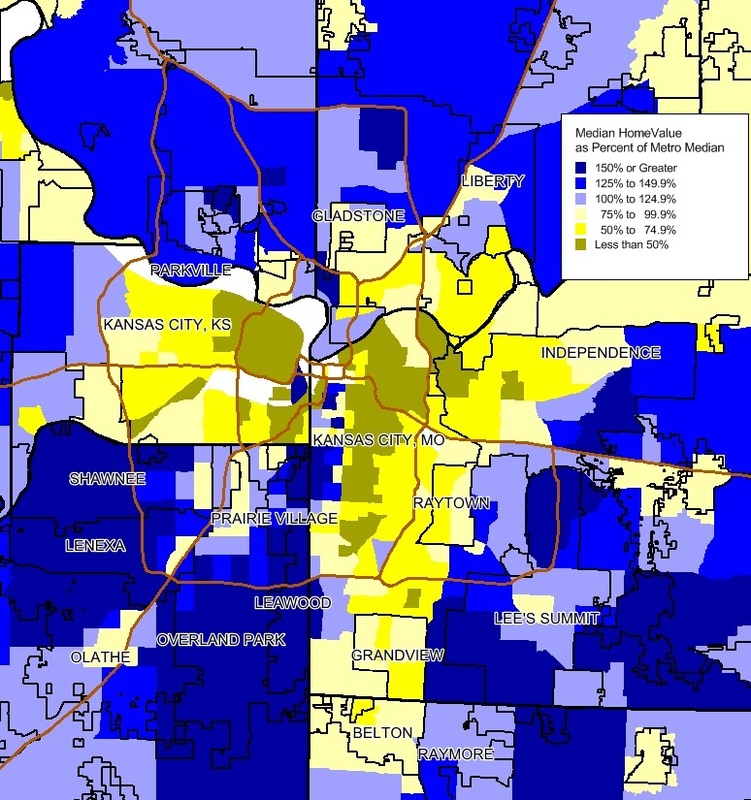 By 2011, the Downtown Loop, River Market and Crossroads areas have median home values above the metro median. Further south, the Brookside to Waldo area is made up of tracts that were already very high value (150 percent or greater) or saw increases since 2000. Likewise, the Northeast Johnson County area, already a high home value area, largely maintained its values relative to the metro. One unmistakable and unfortunate trend is that gentrification has not been able to cross the chasm that is Troost Avenue. The increases experienced in the Downtown-Crossroads area and the Brookside-Waldo area come to an abrupt halt when they hit Troost. As mentioned earlier, there can be a downside to gentrification if it prices out and displaces existing lower-income residents. Such a scenario is important and should not be overlooked. Still, some level of gentrification in areas that have long been lower income could help stabilize neighborhoods and bring more opportunity. Hopefully, the gentrification process that has started in Kansas City’s Downtown-Waldo corridor will eventually spread east of Troost and begin to do just that. Gentricfication is never a good thing for people of color. It is an economic violence against us and our communities.